Air Cylinder features air bearing technology. ISO Cylinders feature pneumo-hydraulic brake systems. ISO Cylinders have active or passive brake systems that hold cylinder's position by clamping onto piston rod. Active brake clamps or releases piston rod when either air pilot port is pressurized, while passive brake remains clamped onto piston rod until pilot port is pressurized. 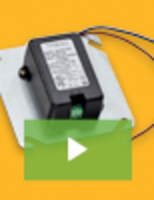 Both versions are available with optional pressure switch that provides electrical signal output. 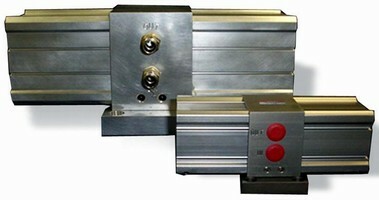 Rodless Band Cylinders are offered in 4 models. Air Cylinder boosts max air flow rate to 250 psi. Miniature Air Cylinder has long-life design. 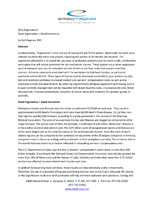 Cylinders meet DIN/ISO 6431 and VDMA 24562 specifications. 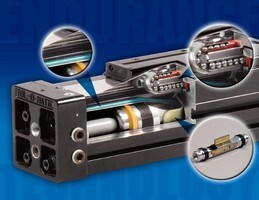 Metric Air Cylinders feature non-rotating design. Constructed with stainless steel square rod that prevents rotation, Series HP.N includes adjustable cushion control, aluminum piston, built-in lubrication system, and position sensing capability. Units are offered in multiple bore sizes from 32-100 mm diameter with stroke lengths from 25-500 mm. Variety of mount options and accessories are available to meet customer requirements. 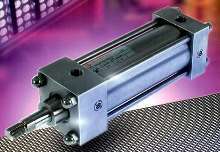 Pneumatic Rodless Cylinders feature space-saving design. 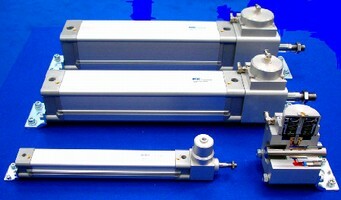 Pneumatic Cylinders are resistant to acid and corrosion. 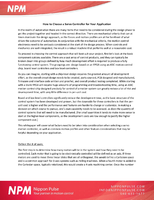 Air Cylinder suits light washdown or dust-off applications.